In April 2009, a large academic medical center switched the low‐molecular‐weight heparin (LMWH] on its formulary from enoxaparin to dalteparin. This formulary change was studied to determine how venous thromboembolism (VTE) prophylaxis rates and events were affected. Because unfractionated heparin (UFH) remained a prophylaxis option before and after the LMWH change, the process measure of interest focused on any corresponding usage change in UFH. The outcomes measure evaluated was the change in rate of VTE and antiooagulation‐retated adverse events. 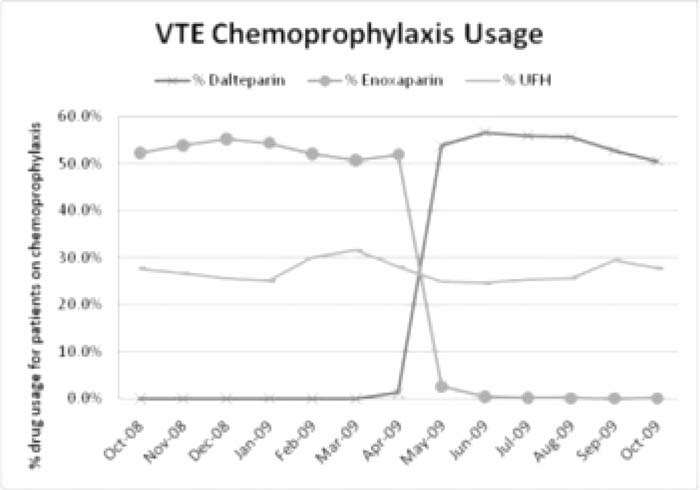 To monitor process changes, all patients with orders for VTE prophylaxis within tfie first 24 hours of admission were reviewed from October 2008 to October 2009, comprising 17,788 patients. If a patient had an order for LMWH, UFH, or warfarin within 24 hours of admission then they were considered to have received pharmacologic VTE prophylaxis. These patients wene then categorized based on the prophylaxis drug that was ordered. To monitor outcome changes, ICD‐9 coded data were reviewed to determine if there was any change in VTE outcomes and to evaluate complications from anticoagulation, designated by ICD‐9 code E934.2. E934.2 is used when there is an adverse effect such as supratherapeutic INR and/or bleeding because of anticoagulalion drugs. For 6 monttis prior to the formulary change (October 2008‐April 2009), on average 52.9% of patients receiving pharmacologic prophylaxis were on enoxaparin and 27.8% were on UFH. For the first 6 months after the formulary change (May‐October 2009), 54.2% of patients receiving pharmacologic prophylaxis were on dalteparin and 26.2% were on UFH. For the 6 months prior to the formulary change (October 2008‐April 2009), the hospital experienced a monthly average of 52.0 VTEs that developed during inpatient stays and 10.4 complications from anticoagulants. For the 5 months after the formulary change (May‐September 2009), there were an average of 48.4 VTEs each month and 10.6 complications from anticoagulants. The formulary change from enoxaparin to dalteparin did not change physicians' ordering practices as it related to the use of UFH as hypothesized. In addition, the LMWH formulary change did not affect the incidence of VTE or complications from anlicoagulalion. Thus, this study provided validation in a practice setting of prior research that showed similar efficacy and anticoagulation‐related adverse events for both LMWH preparations. H. Shah, none; J. Van Dyke, none; S. Greene, none, C. Watts, none. Shah H, Dyke J, Greene S, Watts C. Effects of a Formulary Change for VTE Prophylaxis at an Academic Medical Center. Abstract published at Hospital Medicine 2010, April 8-11, Washington, D.C. Abstract 133. Journal of Hospital Medicine. 2010; 5 (suppl 1). https://www.shmabstracts.com/abstract/effects-of-a-formulary-change-for-vte-prophylaxis-at-an-academic-medical-center/. Accessed April 25, 2019.